Above are the first six verses of Minase Sangin Hyakuin (水無瀬三吟百韻; 1488), a renga written by Sogi (宗祇; 1421-1502), Shohaku (肖柏; 1443-1527), and Socho (宗長; 1448-1632). Renga is a type of collaborative poetry with linked 5-7-5 and 7-7 verses. Lengths vary from just two (tan-renga) to 10,000 or more(!). 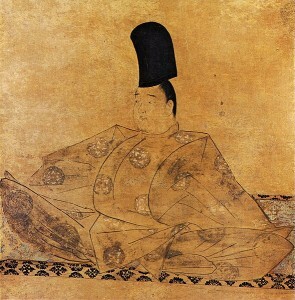 The genre was at its height in the late fifteenth century, and Minase Sangin Hyakuin is often considered the best work in its history. Renga emulated the aesthetics of the world of classic waka and were thought to please gods, especially war gods. At that time renga masters travelled around the country, often invited by feudal lords, and “rolled” scrolls of their verses for religious/political occasions. Gotoba-joko was the strong center of culture in his day and led the editing of Shin-kokin-wakashu (新古今和歌集), one of the best anthologies of waka. Most of all Gotoba-joko was a great poet himself, who wrote great works like the above. He often visited Minase, situated right between current Kyoto City and Osaka City, to spend time at his favorite villa there. He is reported to have been fond of writing renga too, and he enjoyed rolling renga scrolls in Minase for sure. In the poem above he challenges his predecessors’ judgment that evening time is most beautiful in autumn, the common view even among contemporary Japanese. Here Sogi sums up the essence of the waka by Gotoba-joko and sets the tone for the entire renga. The verse has the word “snow” in it, but “mist” in renga is a word for spring and it clearly refers to Gotoba’s waka, so the season here is early spring. Shohaku takes up the river, what Sogi omits, from Gotoba-joko’s poem and follows its flow to where spring is at its height with plum blossoms. Yes, Socho gives a finishing touch to the spring scene the first two verses set up. It is really wonderful to experience the free movement from one season to another that the three poets make through the one hundred verses of this excellent renga. The shed is “temporary” because it is a metaphor for our existence in this world. No matter what life we live, we are just passing through. So, why not live righteously? If you would like to feel the atmosphere of Minase at Gotoba-joko’s time I would recommend you visit the Oyamazaki area next to Minase, just across the border of Osaka Prefecture and Kyoto Prefecture. It is still a cozy quiet recess a little bit away from Kyoto City. There you can visit two attractions: the Oyamazaki Villa Museum of Art and the Suntory Yamazaki Distillery. The museum is up on a steep hill, but don’t worry. You can take a free shuttle bus from both JR and Hankyu Oyamazaki Stations. This text and translations by Keiji Minato. Keiji writes a guest blog for Deep Kyoto once a month introducing Kyoto’s poets and poetry. You can find former articles by Keiji Minato here. Minase Jingu (水無瀬神宮) on Wikipedia and the official site. Very nice article. 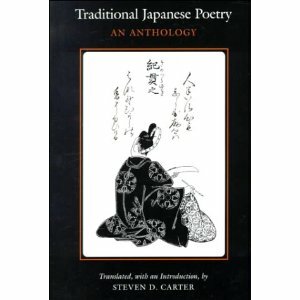 There is a complete translation of the poem in ‘Japanese Linked Poetry’ by Earl Miner, as well as in Steven Carter’s anthology pictured above. Thanks for the good word on the book, Norman!